Single and triple accommodations are available for this tour; call us for rates. Extra nights in Reykjavik are available for an additional charge. Iceland is a country known for its natural wonders: glaciers, active volcanoes, black-sand beaches, geothermal areas, roaring rivers, majestic waterfalls and beautiful lakes. 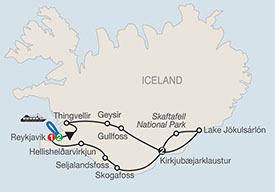 On this Globus tour of Iceland, you’ll witness these natural wonders while enjoying fun and unique experiences. In Thingvellir, a UNESCO World Heritage Site, walk through the rift valley that marks the separation between the North American and European tectonic plates. Stroll with the chef of the Geysir restaurant through the geothermal areas, where you’ll taste freshly baked bread cooked using the heat from the hot springs, with Icelandic butter, boiled eggs and herring. Pair it with a glass of geysir schnapps, served at freezing point. Take a boat cruise to see whales in their natural habitat. Marvel at the Gullfoss Waterfall, drive through the national park at Skaftafell and stop at Lake Jökulsárlón, where you can watch how Vatnajӧkull, the largest glacier in Europe, flows into the lake. This is where some of the most spectacular scenes of the James Bond’s movie Die Another Day were filmed. Enjoy a special Farewell Dinner with wine at one of Reykjavik’s fine restaurants to celebrate the end of your Icelandic adventure. Welcome to Reykjavik! Meet your Tour Director and traveling companions this evening for a three-course Welcome Dinner with wine at your hotel. An early morning optional excursion is available to the Blue Lagoon. In the afternoon embark on a cruise for an unforgettable experience: Watch whales in their natural habitat. After a drive through pretty Reykjavik, continue to Thingvellir, a geological paradise. Walk through the rift valley that marks the separation between the North American and European tectonic plates. Stop at the hot springs at Geysir for a real treat: Meet the chef of the Geysir restaurant in the geothermal areas. Taste freshly baked bread, which is cooked using the heat from the hot springs, with Icelandic butter, boiled eggs and herring, and sip a glass of geysir schnapps, served at freezing point. Marvel at the mighty Gullfoss Waterfall. Drive through the national park at Skaftafell and stop at Lake Jökulsárlón, where some of the most spectacular scenes of the James Bond movie Die Another Day were filmed. Watch how the largest glacier in Europe, Vatnajökull, flows into the lake, forming icebergs. An exciting optional boat trip through the icebergs is available before you return to your hotel. Enjoy a spectacular drive along Skogafoss and Seljalandsfoss waterfalls on your way to Hellisheiðarvirkjun, where you will visit the geothermal heat and electric power station. Return to Reykjavik and enjoy a special three-course Farewell Dinner with wine at one of the city’s fine restaurants to celebrate the success of your Icelandic vacation. Call 855.645.2215 to Book Your Gems of Iceland Tour Today! Prices based on availability, per person double occupancy and are subject to change without notice. Includes accommodations; 19 meals; on-tour motorcoach transportation; guided sightseeing; Rhine River cruise; admission fees to attractions; hotel baggage handling; and all taxes and service charges. A $250 non-refundable, non-transferable, per person, per vacation deposit is required to reserve space for you, with some limited exceptions. Payment of the deposit indicates you have read and accepted these Terms & Conditions. Your booking is not confirmed until the deposit is processed by Globus and you receive a confirmation invoice. Final payment for your vacation is due 45 days prior to commencement of services, with some limited exceptions. Within the final payment date, payment in full is required at time of booking to reserve space. Reservations (land, cruise, and air) are canceled if final payment is not received by the due date; cancellation penalties apply, as noted below. See full Terms and Conditions.